This monster resembles a crow tengu of Japanese mythology. 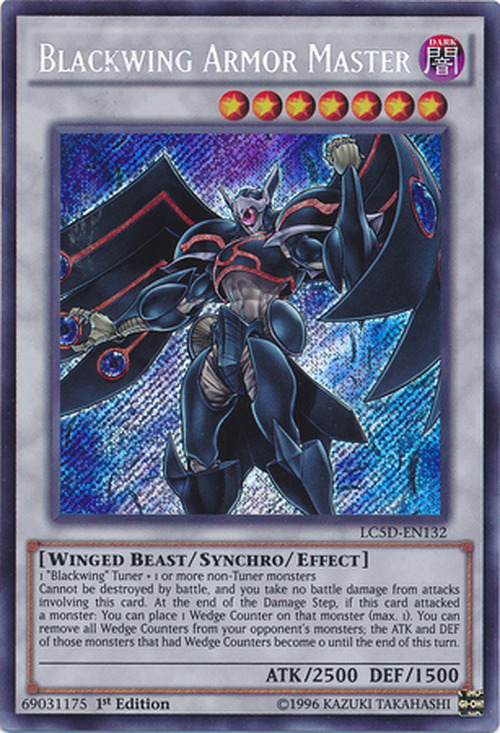 This is 1 of 2 Blackwing monsters that does not have a dash between Blackwing and its main name. The other one is Blackwing Armed Wing. This card's name reflects its effect of not being destroyed by battle. This monster appears in the artworks of Black Wing, Synchro Mirage Attack and Blackwing - Delta Union. 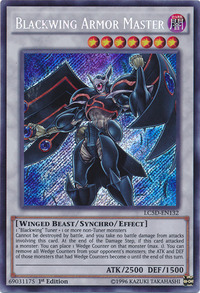 this monster was one of Crow Hogan's Signature card along with Black-Winged Dragon. This monster’s effects do not target. The effect which makes the ATK/DEF of all monsters with a Wedge Counter 0 does not target. Removing all Wedge Counters on your opponent's Monsters is a cost to activate the effect. If "Skill Drain" is activated, do not remove any Wedge Counters generated by "Blackwing Armor Master": Do the Wedge Counters generated by "Blackwing Armor Master" disappear when the effect of "Skill Drain" is applied? If a monster already has a Wedge Counter, the effect of "Blackwing Armor Master" will not activate when it attacks the monster. This includes if the Wedge Counter was generated by a different copy of "Blackwing Armor Master". : When a monster is attacked by multiple "Blackwing Armor Master", can you put 2+ Wedge Counters on the monster with the respective effects? The effect which places a Wedge Counter on a monster activates at the end of the Damage Step, only if the monster is still face-up on the field. : At what time does the effect of "Blackwing Armor Master" which places a Wedge Counter activate?